It’s been a little while since I covered an indie game (at least outside of the ViveStream). And as tends to be the case for me, I chose one in a genre that isn’t really my forte. 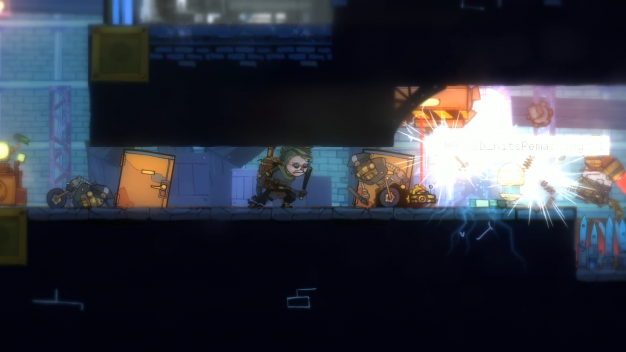 But I was drawn to The Swindle by its style, its use of roguelike mechanics, and most importantly, its lack of pixel graphics. 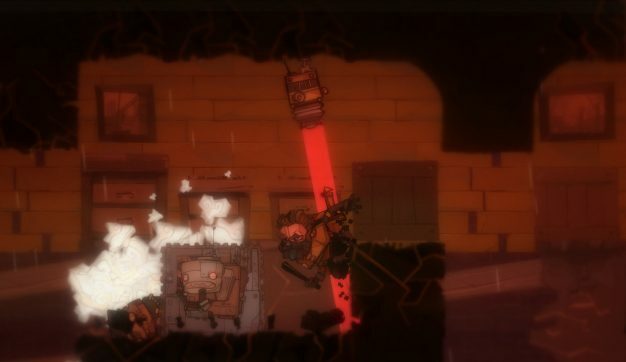 The game takes place in a steampunk universe, and the playable characters are thieves trying to nab as much as they can without getting caught. Stealth is absolutely required for The Swindle, and since I can’t sneak my way out of a brown cardboard box, I enlisted the help of someone who loves the genre: my boyfriend, Alex. But before we get into the ins and outs of the game’s mechanics, I want to take a moment to appreciate its aesthetics. 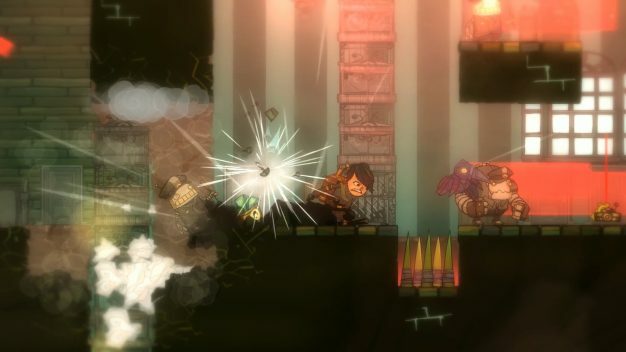 If you’re a fan of steampunk, you’ll get a kick out of the game’s art and style. 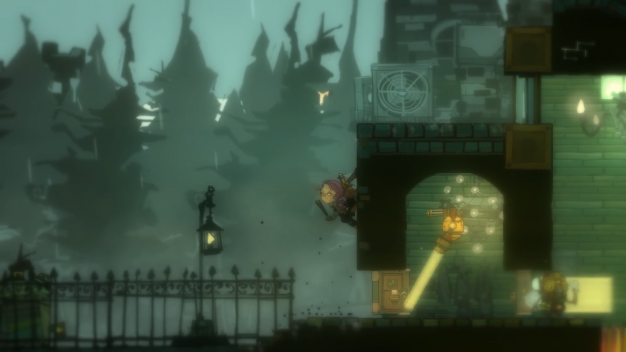 The backgrounds depict a steampunk London perfectly, and the procedurally-generated player characters match the setting well. A lot of love clearly went into the visuals here, and it shows. I’m not the biggest fan or steampunk myself (that’s also Alex’s thing), but even I can appreciate it. And as regular readers know, unnecessary pixel art is a pet peeve of mine, so I’m really glad to see the developers do something different. As for the story, it’s pretty minimal: Scotland Yard is prepared to introduce a new AI that will make thieving pretty much impossible, and you have to stop it. This game is largely a roguelike, so it doesn’t really need more plot than that. The different levels take the forms of different parts of the city, and each time you go to one, you’ll have a new procedurally-generated area to explore and bleed dry. The gameplay is sidescrolling, which makes the stealth a bit more straightforward, but also requires different strategies. As you progress through the game, more and more enemies of different types will patrol the grounds, increasing security each time you enter a stage. You can edit the stage whenever you want, but the idea is to get all the loot available before you leave. I actually couldn’t get past the first stage, myself. There are a few key issues that got in my way. First of all, the game tells you very little. That means you can’t tell that this game with unrealistic physics has falling damage until it kills You, wasting your efforts on the stage. It also feels sort of arbitrary when that occurs. The difficulty also ramps up every time you enter a stage, regardless of how well you did. So if you run into trouble and have to end a run early, when you go back, it will be that much more difficult. Early in the game there are very few upgrades you can purchase, so this turns what would be a barrier into a full on wall that stops less experienced stealth gamers from making any progress whatsoever. At this point, I handed the controller to Alex, who made it past my end point with ease. The trouble came when the game introduced a new type of obstacle: mines. They’re easy to spot, but hard to avoid. After some early frustration, we learned that the best way to get past the mines was to set them off and run away. And that strategy worked well, right until we reached the second stage. Here, the mines were positioned so as to make that impossible. Alex tried hacking the bombs, as the game suggested, but they just exploded every time. Even Alex got fed up at that point. We think that upgrading the hacking skill would solve this problem, but it would be nice if the game told us that. It would be nice if the game told us a lot of things, actually, like how hacking is way more lucrative than picking up cash. People say they don’t want a game to “hold their hand,” but given the fact that one hit will waste all of your efforts in a run, this just seems like it’s making the game artificially harder. It isn’t helped the difficulty keeps increasing even when you fail; I would have given up after just a couple of runs. The trial and error system also doesn’t mesh well with the fact that you’re limited to 100 runs to reach the end. There’s a fun stealth game in here, if you like that sort of thing. The mechanics work decently well when you know what to do, and the style will have a lot of fans. But The Swindle isn’t welcoming enough to keep us coming back to it. It’s more frustrating than it has any right to be. You still might want to give it a try if it sounds up your alley, but be prepared for a bumpy ride.